MV Mahabaahu -- owned and operated by the Indian company Adventure Resorts & Cruises Pvt. Ltd. but sold through agencies like Far Horizon Tours -- is the largest and newest riverboat offering cruises along the Brahmaputra River, which winds its way through the verdant 'tea country' of Assam, in the northeast of India.is the largest riverboat on the Brahmaputra River, which winds its way through the verdant "tea country" of Assam. 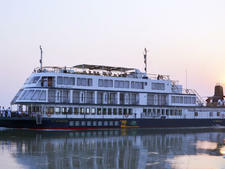 Combining modern comforts on a vessel designed to navigate India's Brahmaputra, Adventure Resorts offers passengers soft adventure cruises "without having to disconnect with the basic luxuries of life." Its one vessel boasts plenty of amenities, including a 26-foot swimming pool; a spa with a steam room, sauna and massage room; a library with more than 200 books; and -- very unusual for a small river ship -- an elevator connecting the four passenger decks, with the sun deck accessed by stairs. The onboard atmosphere is relaxed and there is no formal dress code. Passengers wear loose, practical clothes in the daytime, with comfortable walking shoes and layers for excursions. In the evening, most people change for dinner into something a little smarter, but this is not required. Public areas include a restaurant, which is also used for talks and demonstrations; a lounge and reception area with a pool table; and a souvenir shop and fabric shop, where passengers can have garments made by a tailor during the cruise. The food is mostly Indian, although Asian and western dishes are also offered. Breakfast and lunch, both buffets, features a wide variety of Indian dishes -- both spicy and mild -- along with two western and two Asian dishes. Dinner is a pre-ordered four-course menu, comprising a soup, appetizer, entree and dessert, and a five-course menu for the welcome and farewell dinner. Vegetarians are very well catered for and other dietary requirements can be accommodated. Complimentary bottled water is provided throughout the cruise. Onboard activities include yoga on the sun deck, a daily talk and screenings of movies and documentaries relevant to the areas being visited. There is free Wi-Fi. Cabins can be configured as singles or doubles and beds feature silk headboards, throws and cushions with ethnic embroidery. All cabins have individual climate control, kettles for making tea and coffee, cookies replenished daily, a safe, hair dryer, telephone, mini-bar, TV and DVD player. They all have a bathroom with shower. Toiletries plus robes and slippers are provided. A for-fee laundry service is available. The vessel has two tenders for shore excursions into shallow channels on the river. Based in Haryana, India, Adventure Resorts and Cruises (ARC) provide off-the-beaten track river and land-based vacations in India that combine authentic and sustainable travel experiences with onboard comforts. Most of the passengers are from English-speaking countries and are well-traveled. They are looking to explore India in comfort, while having an authentic experience and exposure to regional cuisine, customs and culture. The company has one vessel, the 180-foot MV Mahabaahu. It is a five-deck ship that was constructed in 2012 and has 23 cabins accommodating 46 passengers. From September to mid-May, it sails on seven-night Sunday-to-Sunday upstream cruises on the Brahmaputra River from Guwahati to Jorhat, and in reverse downstream. Cabins are situated on two decks. There are 12 superior cabins, without a balcony, on both decks that measure 150 square feet. Nine superior cabins are on Deck 1, and these measure 206 square feet and have a panoramic window leading onto a walkout balcony. Also on Deck 1, at the front of the ship, are two balcony suites that measure 283 square feet.